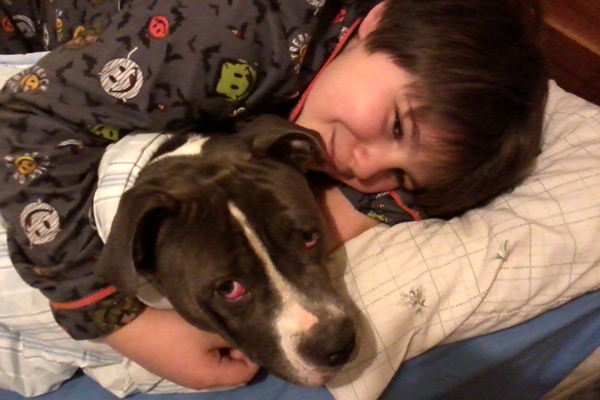 My pit bull Daphney loves it when my 9-year-old grandson Nicolis comes over. Nicolis has created a doggy version of kickball that he plays with all our three dogs. He kicks the ball and runs the bases. If Daphney gets the ball, he has to beat her back to home plate. Daphney also plays basketball with Nicolis. And after a long day at play, they settle down for the night together. She will stay with him until he wakes up. The only problem is that she is a big, old bed hog! @canucanoe2 @theprettychic If “hoggyness” isn’t a word, it should be. Beautiful story and picture……just wonder how the politicians in Maryland can judge this breed as being unacceptable. 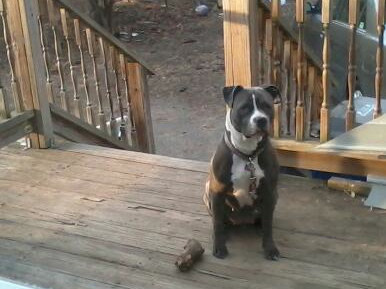 BSL is so unfair…..should be OSL = Owner Specific Legislation !